When I was a young ‘tweenager’ my mother started to get me cooking meals. She taught me about preparing all the basics, selection vegetables, different meats and their cuts and about flavouring things with herbs and spices. Later I would find my own ways of experimenting with simple recipes. 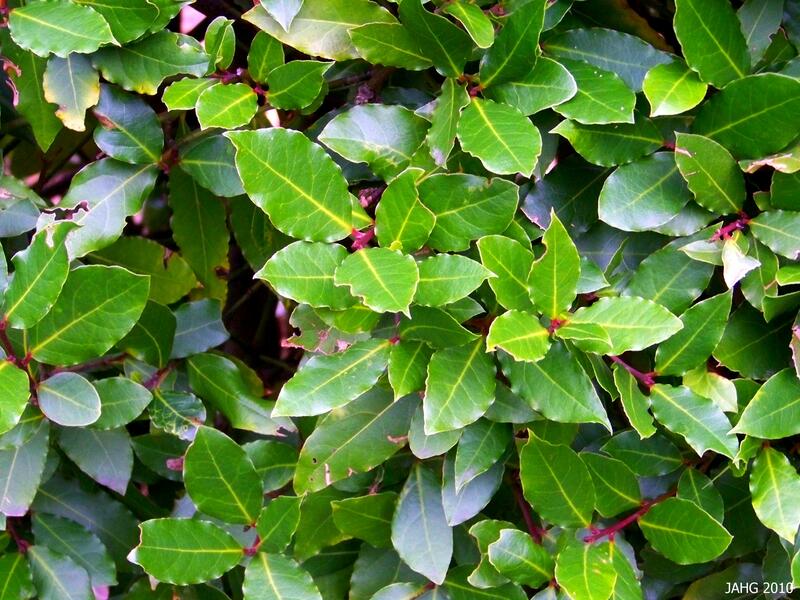 One herb which fascinated me was the Bay Leaf (Laurus nobilis). Imagine my surprise when I saw True Bay Laurel trees growing in front of my sisters place on Government street! The clipped Bay Laurel in front of my sister's place. 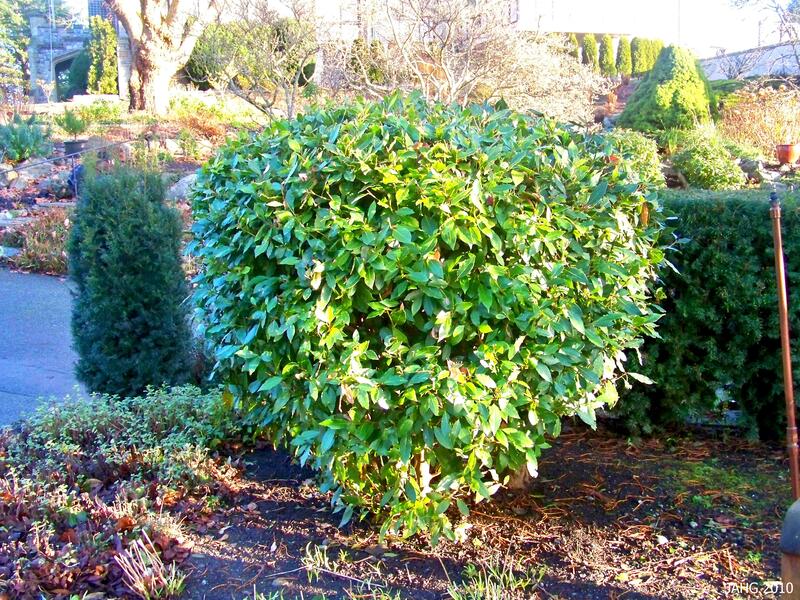 It seems very appropriate to be writing about this plant as it is closely associated with athletic games held in ancient Greece The event winners would receive a Bay Laurel wreath as a prize. The games called the Pythian Games and were held to honour the god Apollo. 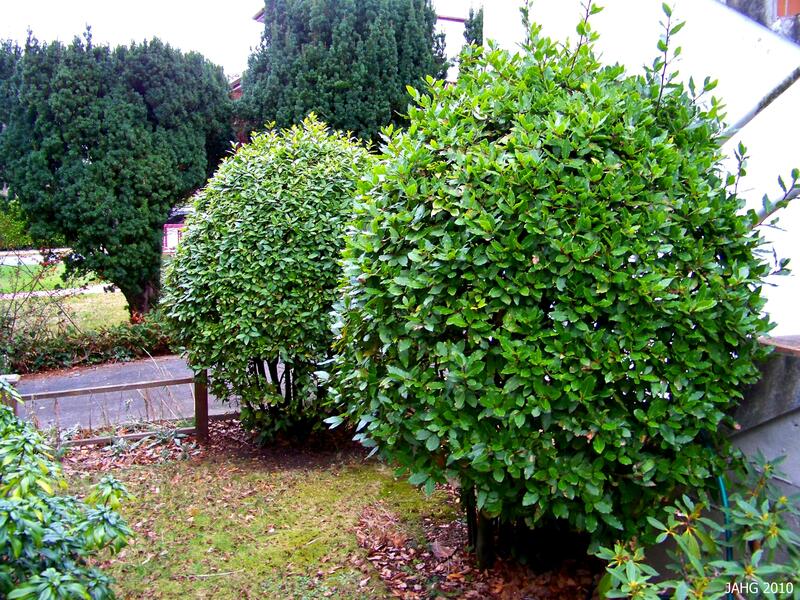 This Laurus nobilis is a multi-stemmed shrub which is regularly clipped. Apollo was amorous of Daphne who did not return his feelings, she ran off and asked her father (Pereus the River god) for help. He turned her in to a laurel tree which was located near the bank of a river. In this disguise she was able to escape from Apollo. Apollo found the tree and made himself a wreath from it’s branches in the memory of her beauty. The Laurel tree was one of Apollos’ symbols. 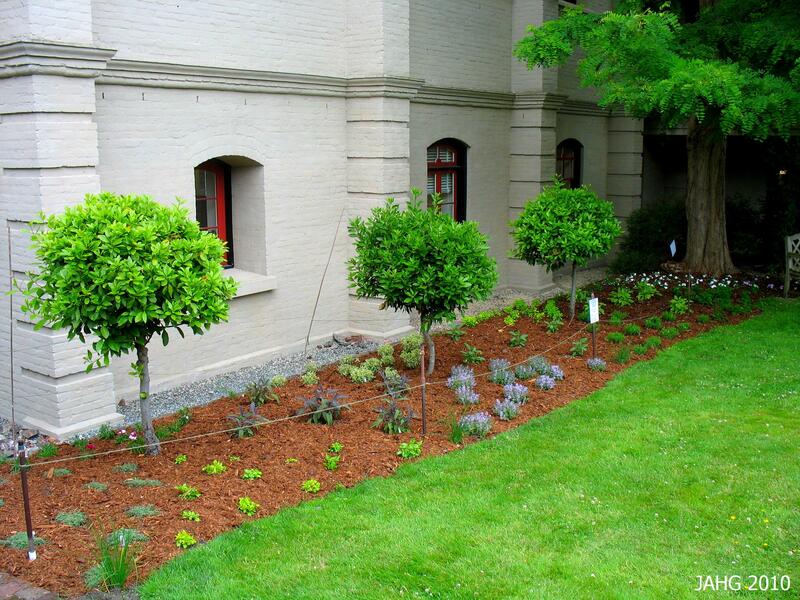 These two True Bay lead into the formal herb garden at Government House, Victoria. Wreaths were also given to important poets and this is where the term Poet Laureate comes from. 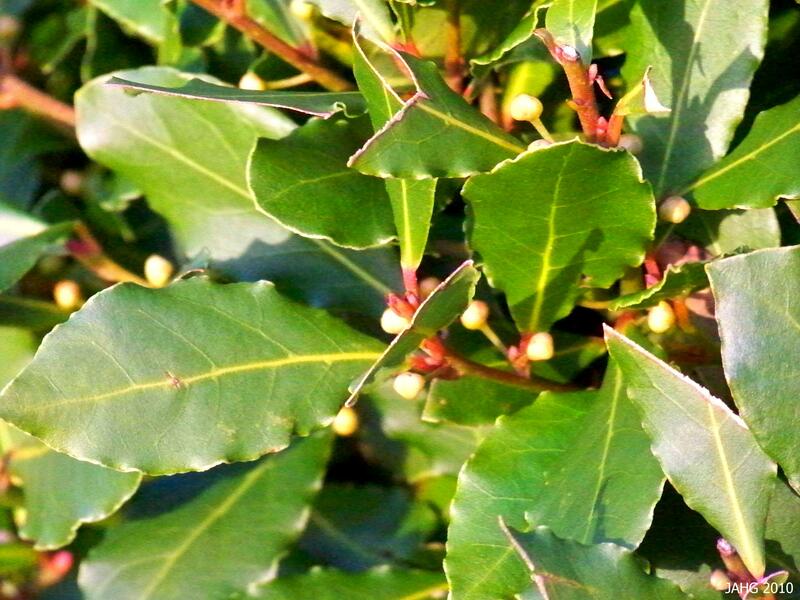 The source of ‘baccalaureate’ is the laurel berry. Christians held the Bay tree to be a symbol of the resurrection of Christ and triumph of humanity. The Bay tree even is spoken of in Chinese folklore in the famous story of Wu Gang. Wu Gang was a man who wanted immortality but neglected his work. When the deities found out about his neglect they tricked Wu Gang by making him think that by cutting down a Laurel tree he could join them. Every time he cut the tree down it would miraculously regenerate and never could be fell. These wonderful True Bay leaves have a spicy scent if rubbed up against. The Bay tree and it’s parts are found symbolized in many places as diverse as the American one dollar bill, ten yen coin of Japan, the shield and flag of the Dominican Republic and strangely is the clan plant of the Scottish clan Graham.. It naturally is very important to the country of Greece where it is found in the national emblem of the country. This Laurus nobilis has set flower buds which will bloom later in the year. For most of us it is a flavouring used in stew and other savoury dishes. It can be harvested as single leaves or as branches and used right from the tree or bush. It also can easily be dried and used later. As my mother taught me one leave goes a long way, so care must be used with this flavouring. The only part of this herb garden which was not replaced were the three True Bays. The California Bay Laurel (Umbellularia Californica) is sometimes sold as the True Bay. The leaf margins on the plant are smooth whereas those of the True Bay tend to undulated. I would not use the California Bay in place of True Bay in food preparation as it has much stronger volatile oils which are not the same. Just another happy Laurus nobilis growing in a Herb garden. In its native habitat of the Mediterranean, Laurus noblis has been cultivated for thousands of years where it grows to about 18m (60ft). 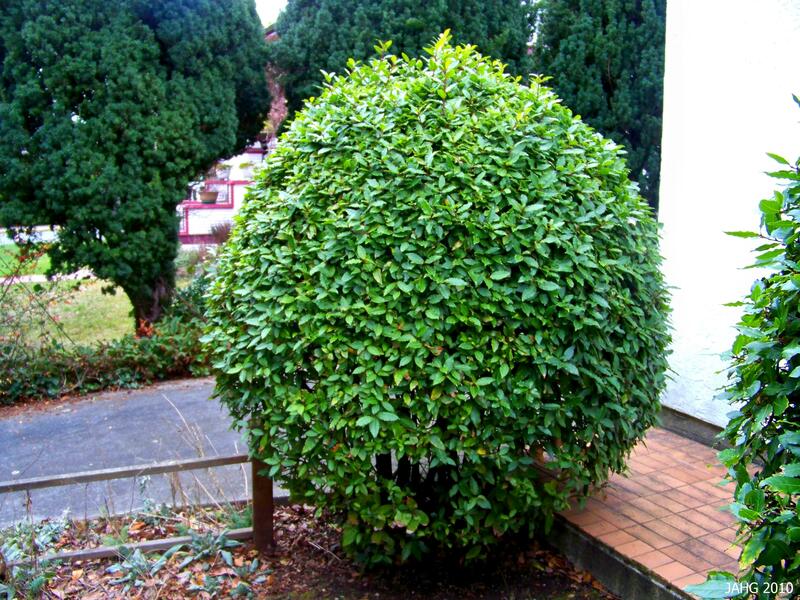 Here it more commonly grown as a clipped, shaped shrub which can be used as a formal hedge, container plant, accent or specimen plant. Buy them as a small trees in a container and then shape it as you please. The True Bay like well-drained soil and full sun. It tolerates short droughts very well and does not like to be over-watered. 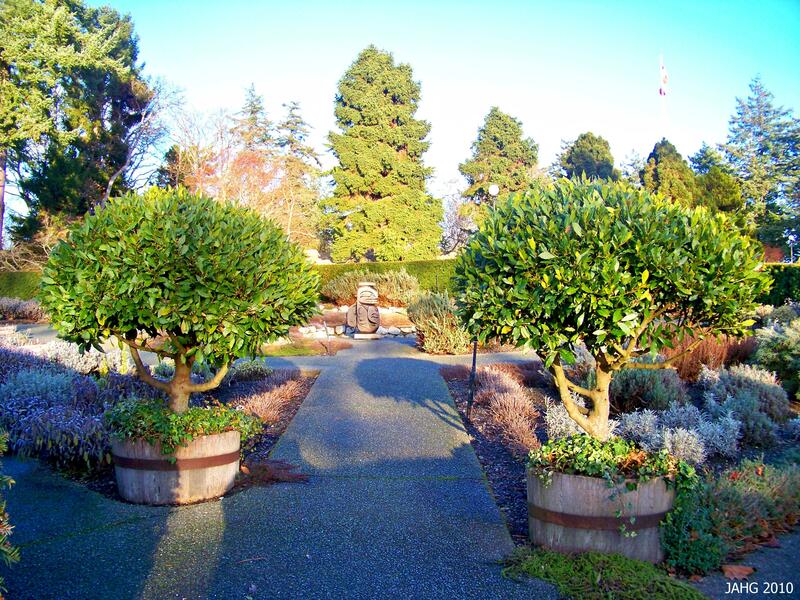 Bay’s live in zones 8 through 11 and tolerate temperatures down to freezing for short periods. Now on to Kim’s yummy recipes! Chives is My Name, So Don’t Wear it Out! The mild flavor of Chives makes it a wonderful versitile herb which as you will see can be used in many different situations whether it is in your garden or on your place. So now its time to High Five the Chive! Since I grew up in a very cold zone 3a( can get as cold as -40c/f) we were severely limited in what kind of plants could be grown. The growing season is short and fast, it can freeze into June and has beeen known to do the same in late August too. Fortunately many good vegtables can be grown as they many have quick seasons being annuals. Salads are supreme! Once we conquered vegtables next we wanted to do herbs. This was more of a challenge. The first one my mother was given was Chives( Allium schoenoprasum) which has survived and thrived admirably there, producing year after year and happily seeding so we had to give it’s offspring away. The Familiar Papery Purple Flowers of Chives. Allium schoenoprasum have been with us a long time as they naturally grow over a wide area of the Northern hemisphere. They are found wild in not only Europe and Asia as well as North America, which makes them the only Allium species which is known in the new and old world. Chives were known to be used by Gypsies in fortune telling( don’t ask me how)! They early on where known to ward off disease and it was common to see dried bunches hanging in the house for this purpose. Medicinally Chives where used as far back as the Roman era to relieve sunburn and sore throat pain. It was believed that eating Chives would increase blood pressure and increase urination. Farmers also knew that Alliums repelled bugs and other pests and would plant Chives along the edges of their crops to protect their main harvests. Chives Are Ready to Harvest When They Are in Bud Like This. Since we all know and have experienced with Onions(Alliums) we know something about Chives, They taste oniony. They can be a tasty addition to many culinary concoctions, the same can be said for in a garden. Chives are one of the more well behaved members for working with in designing. They can be Incorporated in many places and look perfectly at home. They can be used formally or informally and look like they belong. They have long been used in vegetables and herb gardens, but also can be used as an informal, low edging which is soft in the spring and becomes more colorful when in bloom. Here Chives are used as as an informal edging in a medicinal/herb garden. All parts of Allium schoenoprasum are edible with the leaves cut finely to add to flavor soups, salads, sauces and other things. the flowers are added to salads more for the color. the bulbs are generally not harvested now as there are better members for culinary use such as Shallots. Other members of the onion family are very similar with thin grassy leaves and slightly differing flavor. I especially like the local Nodding Onions(Allium cernuum) which have been harvested for centuries by the native peoples of this area which makes an attractive addition to my garden. Another small attracive Onion for your garden would be the white flowering Garlic Chives(Allium tuberosum) which has flat leaves which are slightly ‘garlicy’. Allium cernuum(Nodding Onion) in my garden. Growing Chives and other smaller onions is easy. they need full sun and well drained fertile soil. they do not like drought conditions are will become susceptible to disease if this happens. remember to clean all the debris of the dead leaves in the fall to keep them free of any problems. As they are a bulb it is best to remove the flower buds if you are growing them for repeated harvest throughout the year. they also seed seed very freely if not deadheaded after blooming. Large clumps can be divided in the spring or fall to increase their vigour. Until We Meet Again Next Month Happy Eating…. and Happy Gardening! From Kim: Our Choice is Chives! They are part of Alliaceae (onion family). Chives’ constituents equal those of the close relatives, onions and garlic. The following volatile com­ponents have been identified: dipropyl disulfide, methyl pentyl disulfide, pentanethiol, pentyl-hydro­disulfid and cis/trans-3,5-diethyl-1,2,4-tri­thiolane. Chives contain significant amounts of the vitamins A and C.
Easy dish in the morning to make and remember that breakfast really is the important meal of the day – this is not a heavy meal in the mornings either. It’s not good to eat anything that weighs you down when you still have eight or more hours to go before dinner. Warm pan, add butter. Beat eggs in a separate bowl and add chives. Add eggs to pan. Scramble and pepper to taste. Best to eat right after you fix them. Saute shallots in butter until tender. Add mushrooms, cook until tender. Stir in salt, lemon juice, flour, and stock; simmer 5 minutes or until liquid has evaporated; cool. Beat eggs and cream until mixed. Stir in mushroom mixture. Pour into shell and sprinkle with cheese. Bake at 375 degrees for 25-30 minutes or until set. Garnish with chives. Notice with this dish, I’m combining three onions – shallots, green onions, and chives. They’re all a mild flavor – shallots having sort of a sweet aroma to them and so they complement each other well. I love vidalias and use them the most as far as onions go and I have mixed them with chives too, to me they balance each other out. Oh boy now seafood and chives, I’m really in my element now!!!!! Heat oil in large skillet; add onion, garlic and shrimp; saute until shrimp turns pink. Remove shrimp and set aside. Add tomatoes, pepper, cayenne, basil and salt to the onion mixture. Bring to a boil and reduce heat. Simmer, uncovered for 5 minutes. Add shrimp, parsley and olives to mixture. Serve over noodles with chives. I even like to use chives for the presentation to make the whole meal come together pretty on the plate. It just adds a special touch that the eyes feast on first and I love to play with my food. Mix all ingredients until dough forms, beat 30 seconds. Turn onto surface, dusted with baking mix, gently roll in baking mix to coat. Shape into ball. Knead 0 times. Roll 1/2 inch thick. Cut with 2 inch cutter dipped in baking mix. Bake on ungreased cookie sheet until golden brown, 8-10 minutes, in preheated 450 degree oven. So good!!!!! Here’s my second choice and to me it is a sophisticated looking dish, colorful and all! Isn’t this a lovely way to use chives? I think so, the cherry tomatoes add such dimension with its color but flavor too! Who says everyday ingredients together have to look boring? Cut smoked trout and to fit on top of the crackers. Spread each cracker with cream cheese, top with the trout and sprinkle chives on top. Makes a pretty appetizer! This simple appetizer you can’t go wrong with and I think that when you make anything look nice on the plate, your guests will think you’re a gourmet chef but you don’t have to be to serve really beautiful looking and great tasting dishes! Remember that if you’re not big on cooking. You don’t have to be afraid to experiment – it doesn’t have a set formula the way baking does. And with that said, this concludes my take on chives for this month! Hope you try any one of these and let us know what you think. Visit Jen’s page will give you detailed information on chives along with some beautiful photos!